We are huge strawberry lovers in this household. We buy them all year round but of course this time of year they are getting to be even better. Bigger, redder, juicier and more delicious. 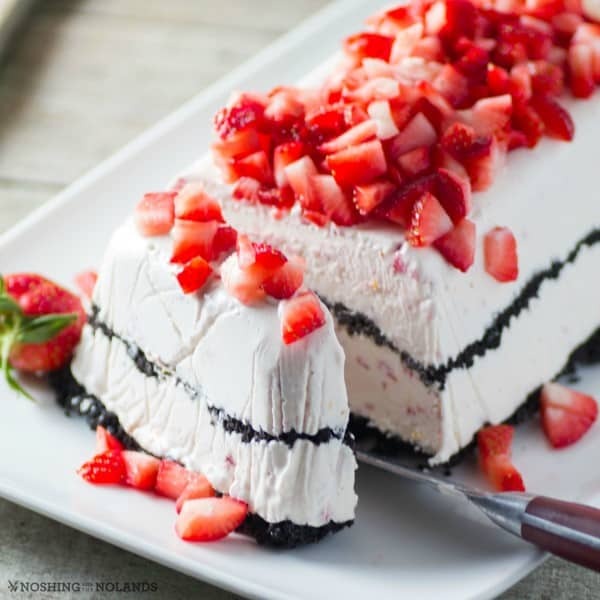 So we whipped up this Frozen Strawberry Easy Dessert for you to enjoy all spring and summer long. I love the combination of the chocolate with the strawberries, a delicious treat and one that everyone will love. 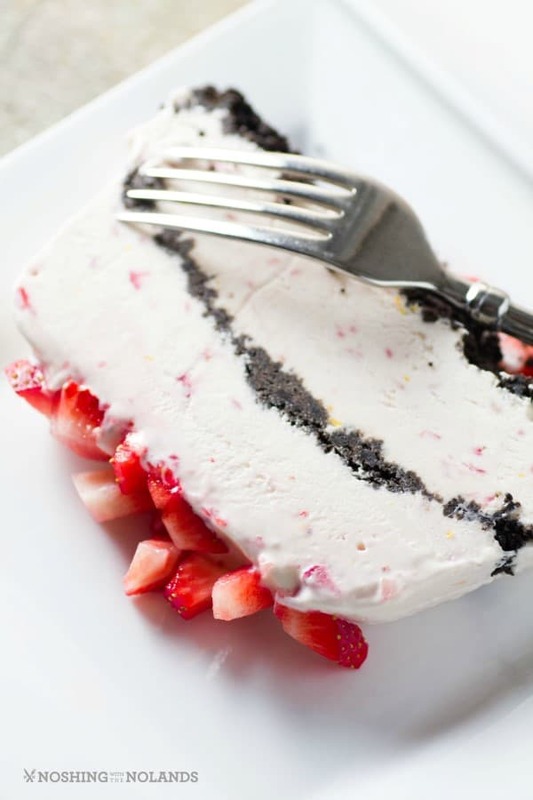 The inside is like a frozen creamy cheesecake, so refreshing and fantastic with the frozen strawberries and then additional fresh strawberries added on top. 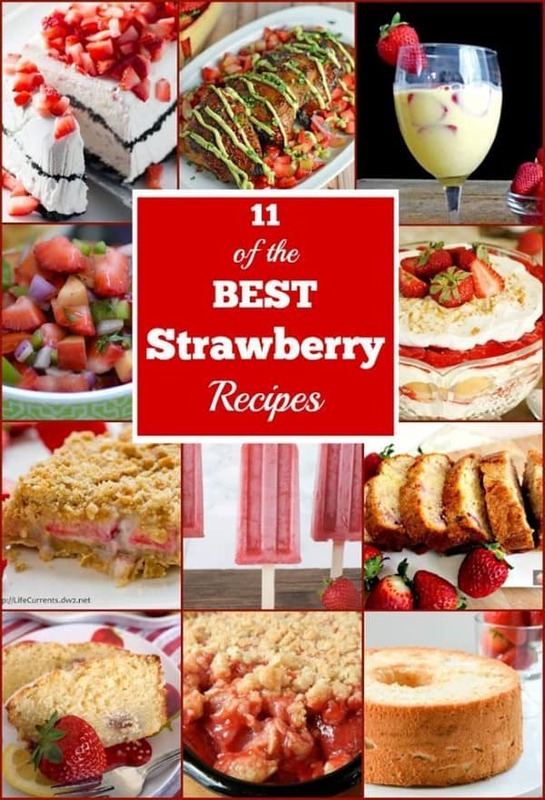 We also have 10 other recipes for you to enjoy strawberries with today. So scroll on down and see what other recipes there are for this delicious berry! Make this up for a special night, you will be amazed how super easy it really is to create but you will be more astonished how absolutely scrumptious it is. 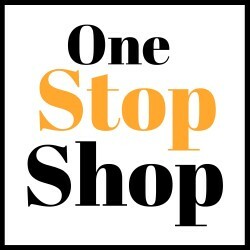 You will instantly get rave reviews!! This is also a wonderful way to celebrate strawberry season and to enjoy this luscious berry to its’ fullest. This is a perfect make ahead summer dessert. It is stowed away in your freezer and ready when you are to indulge in. Just take it out about 15 min. prior to serving for easier slicing! An easy and delightful way to celebrate strawberries and summer. This frozen dessert tastes like cheesecake and ice cream together and will get you rave reviews! Mix chocolate baking crumbs and butter together, set aside. Line a 9x5" pan with plastic wrap and set aside. Microwave white chocolate at 30 second to 1 min. intervals on medium until melted. Mash 1 cup of strawberries in a medium bowl. In a bowl of a standup mixer, beat cream cheese until smooth. Slowly add in milk, melted chocolate, mashed berries and zest. Fold in Cool Whip. Spoon half the mixture into the prepared pan. Top with half of the chocolate crumbs and then repeat layers. Cover the top with plastic wrap and freeze for at least 6 hours or overnight. Remove dessert 15 min. before serving. Finely chop the remaining strawberries. Invert the frozen dessert onto a serving plate. Top with the strawberries and slice and serve. Lets indulge in more strawberries recipes, come and see what everyone else has whipped up for you!! I have strawberries in my fridge everyday and I have to try this. I love a no-bake dessert. No-bake recipes are great for the summer, thanks Jannette! This looks delicious! Strawberry desserts are always a winner with me! Ya, we love strawberries here too! This looks delicious! I love strawberries this time of year, this would be great for a summer party. Thanks for sharing. ? Thank you Lucy, I hope you love it!! Oh Tara! I am in dessert heaven. It’s like an ice cream CAKE! I love it! Thank you so much Lovefoodies! I’m so excited for ice cream season! This is beautiful and added bonus that it is “no bake”. 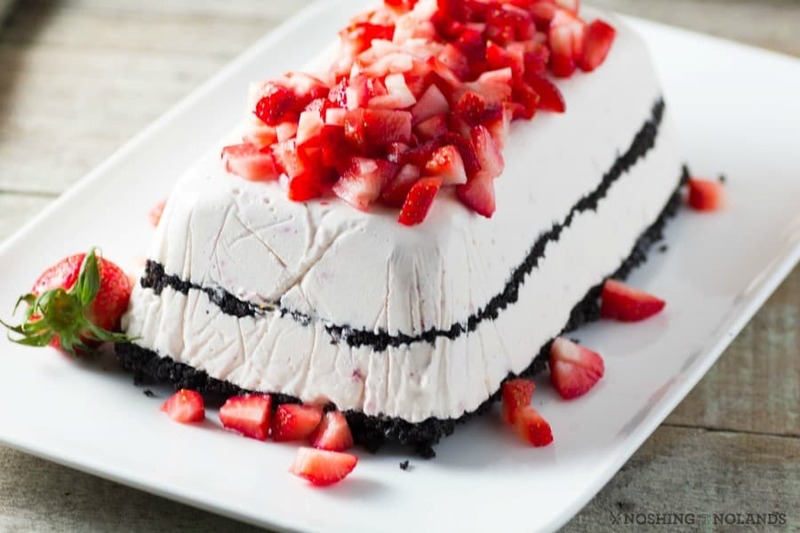 Don’t you just love a no bake dessert for the summer time, thanks Jessica! 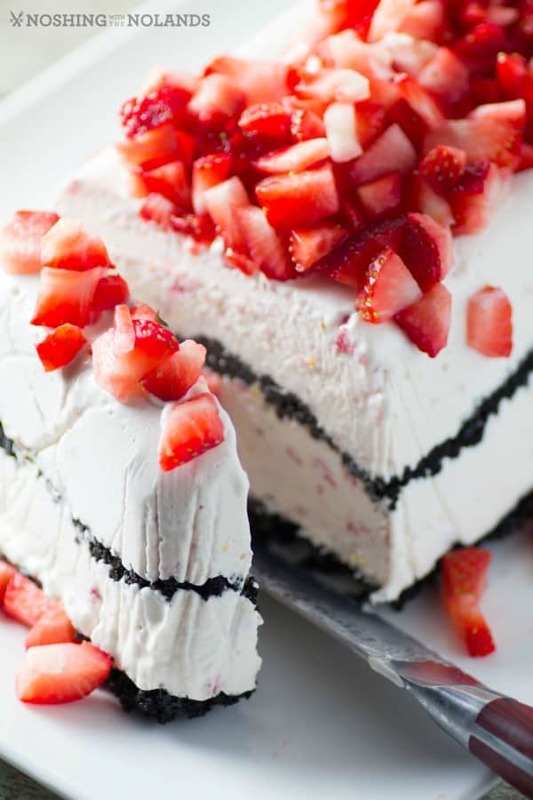 I truly love an easy no bake dessert and this one looks amazing!!!! Had me at strawberry! This looks perfect! I could go for a nice slice of this! Possibly even drizzle some chocolate syrup on top! Sounds absolutely scrumptious! This looks stunning! I can’t wait to try it! Pretty sure this would be a hit with the whole family! Great recipe and photos! Such a great dessert to make ahead & keep on hand for when you need a treat unexpectedly. It’s gorgeous … and I bet it tastes even better than it looks! Love strawberries! Your dessert looks delicious and thank you for the links to the other yummy recipes too! Gorgeous dessert, it sounds just amazing! This looks wonderful, perfect for spring! What a great dessert for summer. It sounds so delicious! The recipe doesn’t state which size cream cheese to use. 4 oz or 8 oz? Didn’t know you can get 4 oz., it is 8 oz. and I will make the change, thank you! May I know a good substitute for chocolate baking crumbs? Why do you want a substitute and maybe I can help better? Because I cannot find that in the supermarket. So, I was a bit intimidated to try this recipe. I just wanted to thank you for posting such a delicious dessert that baby bakers like me can pull off! Have a blessed day! Way to go, I am proud of you for venturing out and trying something new. Hope you have the confidence to try some other. Hope your day is grand also!